Today i will discuss about Basic Layout of Huawei OLT. Bellow are the details…. Chassis: bundled sales, not sold separately. MPU: generally double master, one for main and one for standby, SCUN, MCUD (MA5608T) are common used. Power Plate: generally dual power, one for main and one for standby, PRTE (DC), MPWC (DC), MPWD (AC) are common used. Upstream board: GICF, GICG, X2CS etc. 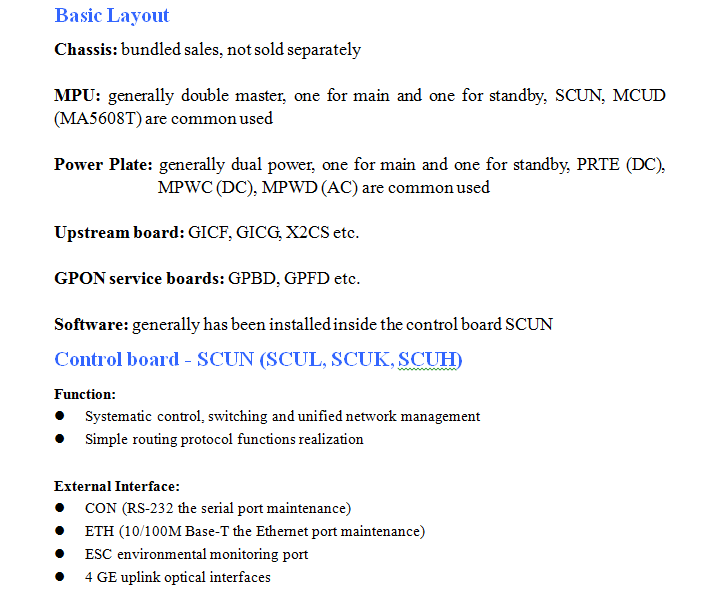 GPON service boards: GPBD, GPFD etc. MA5608T, divided into two kinds, AC and DC. Software issues related to compatibility between Huawei OLT and Huawei ONT, with some compatibility version is better, and some relatively poor.